R. Sekhar Chivukula serves as the Associate Provost for Undergraduate Education and Dean of Undergraduate Studies at Michigan State University. In this role, he is responsible for overseeing University-level undergraduate initiatives that support and enhance the undergraduate experience, providing direction to a number of University-wide programs that serve undergraduate students, and coordinating the development and implementation of academic policies and procedures related to undergraduate education. 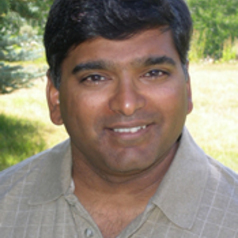 Chivukula is a Professor of Physics in the Michigan State University Department of Physics and Astronomy. He received his Ph.D. from Harvard University in 1987. Subsequently, he was a postdoctoral fellow and then a faculty member at Boston University, where he also served as Associate Chair for High-Energy Physics and as Director of Graduate Studies. He moved to Michigan State University in 2003, where he has served as Chair of the University Committee on Academic Policy. Chivukula's research focuses on the theory of electroweak symmetry breaking and on the phenomenological implications of theories beyond the standard model of particle physics. He teaches at both the graduate and undergraduate level, and is committed to incorporating active learning in all of his classes. Chivukula enjoys making interactive presentations on particle physics and cosmology to the general public and to K-12 students and teachers. From 2010-2016, Chivukula served as the Associate Dean for Faculty Development in the MSU College of Natural Science. In that role he organized faculty development programs, oversaw policies for college reappointment, promotion, and tenure, faculty search and mentoring, and implemented college policies for teaching evaluation, faculty annual evaluation and workload, and faculty development. He was a co-founder of the workshop series on Teaching Essentials for MSU Faculty, and of the MSU STEM Educational Alliance. He serves as Project Director for the MSU HHMI STEM education project, LEVERS, and as a PI for the Dow STEM Scholars Program. Chivukula has served on the Gilman HEPAP subpanel, on DOE particle physics laboratory review panels of Argonne, Fermilab, and Brookhaven, as a DPF University representative to HEPAP, on the editorial boards of Physical Review Letters and Physical Review D, and serves as a consultant to the Particle Data Group. He is a co-founder of the LHC Theory Initiative, has worked to organize online postdoctoral applications in high-energy theory, and served as Chair of the 2010 Sakurai Prize Committee.